Dock Accessories | Dock Bumpers, Cleats and Pipe Caps | VE-VE Inc. This versatile rectangular 24" Long X 4-1/2" Wide "Bumper" is designed to be mounted directly against the deck or slightly outboard by the use of an additional bracket. NOTE: See Brackets Above OR ( CLICK HERE ) to see. D-541; ( for 1-1/4" Pipe ), D-546; ( for 1-1/2" Pipe ) Or D-548; ( for 2" Pipe ). This versatile rectangular 36" Long X 4-1/2" Wide "Bumper" with ( 3-1/2" wide recess on back side ) is designed to be mounted directly against the deck or slightly outboard by the use of an additional bracket. 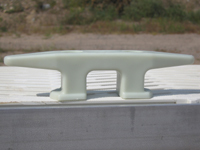 The D-5408; "Dock Cleat" is 8" long and injection molded from nylon plastic . Simply bolt this cleat on to your dock through the 2 molded in holes in the legs of the cleat. NOTE: White model shown, stocked in BLACK only. The D-5408-S; "Dock Cleat" is 8" long and is galvanized cast iron. Simply bolt this cleat on to your dock through the 2 molded in holes in the body of the cleat. 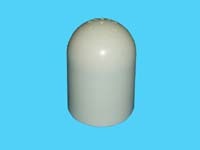 NOTE: White Nylon cleat shown, actual D-5408-S is a gray colored galvanized cast Iron product. 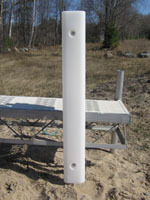 The "Pipe Cap" fits over 1-1/2" dock pipe that is 1-7/8" O.D. 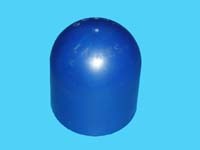 These round injection molded pipe caps are made with marine grade vinyle and fit snuggly over the top of the pipe for a safe and attractive finish. ( Color is GRAY ). 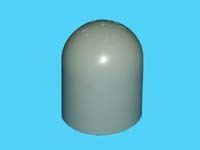 D-56; "Pipe Cap" ( For 2" pipe. ( 2-3/8" O.D. )). The "Pipe Cap" fits over 2" dock pipe that is 2-3/8" O.D. These round injection molded pipe caps are made with marine grade vinyle and fit snuggly over the top of the pipe for a safe and attractive finish. Shipping is FREE when ordered with a dock bracket order!!! !